Read with my 7 yo. Good story, great to talk about towers, castles, moats. Another historical fiction children's book that is impressively accurate about the time period in which it is set. This was a quick, simple read for my upper elementary student, but it was not so easy that the plot was simplistic and boring. It kept my attention as an adult and I was pleased with how it conveyed the sense of uncertainty for widowed women and her children in the Middle Ages. Also, the main characters are two resourceful and plucky children and so readily identifiable with the intended audience. This is an easy book for someone entering middle school. I used it for read aloud fluency for my son. It was simple, but he liked it. However, I do have a problem with it categorized as a history book. This was historical fiction and should have been classified as such. It lead to a conversation about how books are classified, so that was an unplanned teaching moment. Very easy intro to the Middle Ages. I think it could have been more complex. I read this over a year ago and finally read it to the kids. I think it's a decent book, but not great. You don't learn a whole lot about the historical era (year 1195) which is one of my main reasons for seeking out historical fiction so in that aspect it fell short. The boy is portrayed as rather weak, but he does 'come into his own' later while the girl is very tom-boyish and strong. Being the mother of all boys I typically try to stay away from 'boys are weak' type books. The boys thought this was "okay". It's a little on the dull side and the action is never very actiony. (It's my review so I can make up words if I want too.) I don't think we'll be reading this again. Updated February 2014 - My 10-year-old read this and really enjoyed it. He chose to read it over his 'exciting fun book' several days. I wonder whether my opinion of this was affected by knowing it was written intentionally to be an easy read for middle-school students. I would've pegged it for a much younger audience. To me, the story line seemed to be oversimplified along with the language. It's a fine little story, but there's just not much to it. In the time of the crusades, sister and brother have an urgent errand to do because their mother is desparately ill, they run afoul of some bad guys, and the reader can pretty well predict the rest. A reader for young children set in the year 1195 during the time of King Richard the Lionheart. Their mother deathly ill and their father on crusade, a penniless brother and sister set out for Bordeaux to locate their uncle Raimond, a rich baron, who they hope will be able to rescue their mother from her illness. The only thing they bring with them is a prized lute decorated with a soaring eagle so they can sing for their food. On the way they make some shifty acquaintances. gr 3-4 62pgs1195, France. The Crusades have been over for a year and still Roger and Alice's father has not returned. When their mother becomes deathly ill, she tells them to take her lute to Lord Raimond, their mother's brother. Alice and Roger are shocked to learn they have an uncle and that he is a lord, will they be able to find him in time?Interesting story. This book was simple and quick to read. It wasn't the worst way to introduce the middle ages to children through story. It wasn't the most exciting and well written book we've read so far, but my kids enjoyed it and were able to follow the story. I personally would have liked to see more character development and smoother transitions from scene to scene. I read this to my girls as part of our history curriculum. 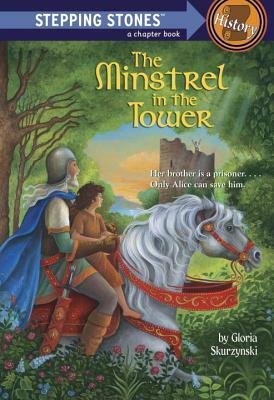 Though not a great story or great history, it is a good, simple story about two children living in medieval times. I think it fits best to a 9-11 yr old reader studying the time period. Two children must travel across France in the Middle Ages to find their uncle. Full of adventure, you can't help but admire both plucky Alice and her brother Roger as they find their courage and learn from each other. My daughter really loved this one. I liked this book. In the book the kids' mom was ill. They set off on a journey to find uncle Lord Raimond, the baron. One of the kids gets locked in a tower. Time is running out. Will they save their mom? Is he a dream? hmm (: Read it and find out! Takes place during the Crusades. A fun quick read (we read it in about an hour!) it's a little adventure following a pair of siblings in the middle ages. We enjoyed this story very much. I read this with the kids for their homeschool curriculum. It was a very simple story, pretty predictable, and definitely not as good as most of the read-alouds we enjoy. But the kids enjoyed it. In the year 1195, Alice & her brother, Roger, go to look for their sick mother's brother, a powerful baron. Quick read. It's the first book we read for my six year olds book club. This is the current read aloud for Clara and Max. It's short so we will finish it this week. A very short read, we read this as a read aloud together, but my kiddos truly could have read it themselves. It was an ok story, I think it makes a better reader than read aloud, in my opinion. The children in this book demonstrate love for their mother and each other. It's great. A good short early reader to go along with a study of medieval times. "It is a great book" says my daughter. Loved the references to historical events. This is an enjoyable short chapter book suitable for kids 6 to 10 or so. I read it outloud to my kids to go along with our theme unit on Medieval times. Both my older and younger kids enjoyed it. Gloria Skurzynski Julek Heller - "May you live in interesting times. "That ambiguous wish was not meant to be kind, because interesting times can be difficult. You and I certainly live in interesting times - dangerous, challenging, and fascinating.My parents were born just before the start of the twentieth century; my youngest grandchild arrived in this century's final decade. The years in between have been the most dynamic in the history of the human race. Technical knowledge has exploded; so has the Earth's human population. We can create almost anything, yet each day we lose parts of our planet that can never be replaced.I'm greedy: I want to write about all of it - the history, the grief, joy, and excitement of being human in times past; the cutting-edge inventions of times almost here.--from the author's websiteGloria Skurzynski has also co-written books with her daughter Alane Ferguson.